The Trinidad and Tobago Computer Society (TTCS) has put together a collection of nearly 90 Open Source Software for WINdows (OSSWIN) available for download as an 4GB ISO. Called TTCS OSSWIN, this collection of Free and Open Source Software is for any home or business (i.e. any) user running Microsoft Windows (Windows 10, Windows 8, Windows 7) on their computers. You can use your web browser to read detailed information about each program in this compilation : what the program does, view a screenshot or video of the program, and to find links to the program’s website and to download/install the program from the TTCS OSSWIN collection. Alternatively, you can also browse TTCS OSSWIN online at http://ttcsosswin.ttcs.tt/ which features the web interface to learn about Free and Open Source programs in various categories, including screenshots or videos of the programs and a link to the program’s website where you can download the program. 2 How can I get the TTCS OSSWIN? 2.0.1 You can download the TTCS OSSWIN ISO from MediaFire. 7 How is the TTCS involved in this project? 8 What is Free and Open Source Software? All of the software on TTCS OSSWIN is in the “Software” folder with subfolders for each of the categories. This makes it easy for those users who are familiar with the collection to use Windows Explorer to browse and install software on another machine. The TTCS OSSWIN collection is regularly updated every few months. We also have TTCS OSSWIN online at http://ttcsosswin.ttcs.tt/ which features the web interface to learn about Free and Open Source programs in various categories, including screenshots or videos of the programs and a link to the program’s website where you can download and install the program. How can I get the TTCS OSSWIN? If you have broadband, you can download the latest TTCS OSSWIN as a 4GB ISO file. You can download the TTCS OSSWIN ISO from MediaFire. You can also browse TTCS OSSWIN online at http://ttcsosswin.ttcs.tt/ which features the web interface to learn about Free and Open Source programs in various categories, including screenshots or videos of the programs and a link to the program’s website where you can download and install the program. Use a program like VisualHash or WinHasher to hash your downloaded file to see if it matches the hashes here. If your downloaded file hash is different, then your downloaded file is different from the file the TTCS has published and should NOT be trusted. You can use 7-Zip to extract the files to a folder on your hard drive or removable storage such as a USB flash drive. Alternatively, you can use a program like WinCDEmu to “mount” the ISO file to view and access the ISO as if it was an DVD disc in a DVD drive. Finally, you can use a DVD burner and DVD burning software like IrfraRecorder to burn the ISO file onto a blank 4.7GB DVD. This collection of Free and Open Source Software is intended for use on the following versions of Windows : Windows® 10/8/7/. The software requirements for each program/application varies but if your Windows PC is already running a program that falls in one of the categories (e.g. Desktop Applications, Graphics, Internet, etc) it can probably run the programs listed under that category. Below is the software included in the TTCS OSSWIN v2.40 created November 9 2018. 7-Zip 18.05 file archiver with high compression ratio. 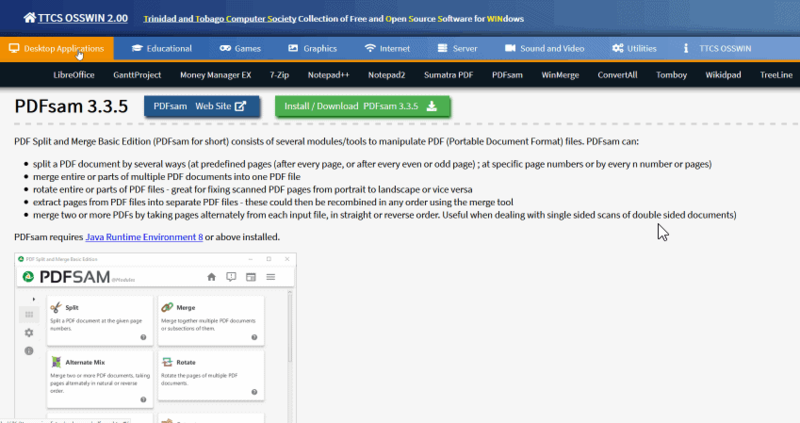 Sumatra PDF 3.1.2 slim, portable, Free and Open Source Software PDF viewer for Windows. WinMerge 2.15.5 WinMerge is a Win32 tool for visual difference display and merging, for both files and directories. Speedcrunch 0.12 fast, high precision and powerful desktop calculator. SuperTux 0.5.1 a 2D jump ‘n run sidescroller game. GIMP 2.10.6 bitmap editor suitable for photo retouching, image composition and image authoring. Mozilla Thunderbird 60.3.0 powerful e-mail and newsgroup client. HTTrack Website Copier 3.49-2 HTTrack is a free and easy-to-use offline browser utility. PDFCreator 3.3.0 easily create Adobe Acrobat® PDFs from any Windows application that can print. mDesktop 1.7.2 A free, fast and feature-filled virtual desktop manager for Windows. AxCrypt 2.1.1573.0 File Encryption Software for Windows. Ant Renamer 2.12.0 makes easier the renaming of lots of files and folders by using specified settings. Downloaded, tested/evaluated the various applications, utilities, games, etc. included in the compilation. Where necessary, created installers for those applications without an installer. Created and tested the web based user interface. Created a web page for each program with the program’s description, its key features and related links. Distributes the collection online for use by general public of Trinidad and Tobago and worldwide. Free and Open Source Software is software for which the “guts” of the program can be freely downloaded and altered to suit your needs (provided you can do the programming). There are many types of Free and Open Source Software. The difference lies in the way altered versions of the software can be distributed, so, if you customise the software for your own needs, then decide to distribute it, you may be bound by specific terms. Many Free and Open Source Software projects make ready to install executable versions for various operating systems including Windows. Install the software on any number of machines in any environment (home or commercial) without purchasing licence fees for each machine. Obtain and modify the source code and distribute modified versions of the program together with the modified source code. Free and Open Source Software licenses differ in how such source code can be distributed or licensed for others to also do what you have done. The Open Source Definition Published by the Open Source Initiative (OSI) organisation. It lists the criteria by which software can be considered “open source” software. The Free Software Definition – “Free software” as defined by the Free Software Foundation (FSF). The word “free” refers to freedom, not price. Why “Free Software” is better than “Open Source”. While “free software” meets the definition of open source software, not all open source software meets the free software definition.